Complex conflicts set new competence requirements for non-governmental organizations working in the field of humanitarian assistance. 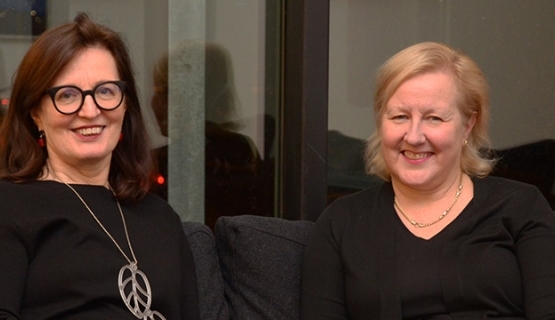 On the other hand, businesses can also learn from the non-profit sector, say Kristiina Kumpula, Secretary General, Finnish Red Cross, and Riitta Lumme-Tuomala, Head of Growth, Aalto EE, who explored the theme in her DBA (Doctor of Business Administration) dissertation. Talent management is considered a critical factor for ensuring the success of an organization. Companies invest heavily on identifying, attracting, developing, and engaging talent to make sure they have the best possible resources to implement their strategy and achieve their targets. The non-profit sector, particularly humanitarian aid organizations, often values practical experience over potential. This is due to the pragmatic nature of disaster operations, says Kristiina Kumpula, Secretary General, Finnish Red Cross. "The view has been that when you have once worked successfully in an emergency operation, you are capable of doing it again in the future. And when you have done it enough times, you are a good leader," Kumpula says. Riitta Lumme-Tuomala, whose DBA dissertation explores talent management in the context of humanitarian aid organizations, says that emphasizing experience is based on the kind of work these organizations do. "In this context, experience cannot be altogether overruled. The conditions in disaster areas are so tough and unpredictable that you need a different kind of understanding than when you're transferring from one industry to another." Kumpula brings up an anecdote from Bhuj, India, which suffered an earthquake in 2001. An aid worker assigned tasks to locals who had arrived at the scene to help, but no progress was being made. The reasons became clear only after one of the locals opened his mouth. "In India, cleaning toilets is a job for the low-caste, but the aid worker had assigned this task to a brahmin. You must be aware of these things beforehand. You can't start inquiring about caste once on site," says Kumpula. Managing a humanitarian aid organization is different from managing a business in that your key objective is not maximizing financial gain but meeting human needs. Lumme-Tuomala says it's obvious that this is reflected in the requirements. However, she says, there's a limit to how widely it should be reflected in them. Both Kumpula and Lumme-Tuomala emphasize that looking backwards is not enough in a world that has changed profoundly. One reason for the need for new kinds of skills and competencies is that conflicts and disasters have in many ways become more complex than before. "In a conflict, for example, the counterparty is often no longer the local army, but instead an armed group of some sort," Kumpula says. The complexity is compounded by the convergence of three concurrent trends. Climate change causes an increase in natural disasters and drives people into urban areas. This, in turn, increases the risk of pandemics and potentially also fuels armed conflicts. In the new millennium, urban areas have become primary targets for humanitarian operations. "International aid developed in an era when most of the population in third world countries lived in rural areas and suffered from famine caused by crop failures. Urban disasters call for a totally different set of skills and competencies," Lumme-Tuomala stresses. Another factor behind the need for new competencies is the changed role of the aid recipients in the era of digitalization and globalization. "Previously, we might have thought that we are accountable only for our donors in Finland. Now we see that we are also accountable for the recipients of the aid we provide," Kumpula says. Aid is no longer delivered to passive recipients but to skilled and knowledgeable people with their own demands, who are also participants in the aid operations themselves. Leadership is horizontal: it involves discussion, networking, and negotiation." "Like in many other industries, the need for good communication and interaction skills has increased. Leadership is no longer from the top down but horizontal: it involves discussion, networking, and negotiation," says Kumpula. The third change factor that Kumpula and Lumme-Tuomala mention is the increasing need for humanitarian aid. Charity has turned into big business. "It's an industry that's growing exponentially. In 2015, the value of international humanitarian response reached US$ 28 billion," Lumme-Tuomala says. The number of employees has also swelled in the last few years. Whereas in 2012 humanitarian aid organizations employed some 270,000 people globally, in 2015 the number had reached 450,000. Of the 450,000, approximately 145,000 were Red Cross and Red Crescent field staff, most of whom were employees of the national societies of countries of low income. Tasks are varied and you must be able to work closely with extremely diverse teams." "There is great diversity in skills. This is one of the peculiarities of humanitarian aid: tasks are varied and you must be able to work closely with extremely diverse teams," says Lumme-Tuomala. In the corporate world, projects are generally relatively straight-forward, at least to start with. In disaster situations, we may lack information about the scale of the catastrophe, who else is there to help, and what resources are available. "Usually we must make up the action plan when we still don't know how much funding we're going to get. We have an estimate of sorts, of course, but we can't wait for the actual financial decision," Kumpula says. As described above, the key skills and competencies in the humanitarian aid organizations of today and the future include adaptability, agility, resilience, networking, collaboration, and managing partnerships and complexity. Leaders and managers, in turn, are expected to identify related potential and ensure its development. Red Cross has a systematic approach in place for engaging new Leaders for Emergency Operations "There is no disaster simulation involved, but instead the candidates work independently from the very beginning, possibly leading a small team. They make real decisions in real situations instead of just shadowing," Lumme-Tuomala says. The future leaders are supported by a mentor, and they are jointly responsible for managing a single disaster operation from start to finish." The future leaders are supported by a mentor, and they are jointly responsible for managing a single disaster operation from start to finish. The mentors are also involved in planning and implementing development programs. This works out very well, says Lumme-Tuomala. "The way the high potentials, or talent, are prepared for the future, while also being tested, would be worth trying in a business context as well." The Finnish Red Cross is testing a new way to develop its operations: Red Cross Ambassadors. The idea originated among Aalto EE Alumni who wanted to donate their skills and expertise for the benefit of a humanitarian aid organization. The Ambassadors are Red Cross advocates in their organizations, arrange various events, and share information on Red Cross campaigns. "Previously, we had the private sector, the public sector, and the non-profit sector, and everyone lived happily ever after in their own pigeonholes. Now we have complex problems to solve, and no one organization can do it alone," Kumpula says. Kumpula says that Red Cross Ambassadors is one way to explore whether a non-profit organization is capable of creating a new kind of partnership with the private or public sector, and have a positive impact on the operations of both parties. "After all, the non-profit sector has many characteristics that the public sector, for instance, is lacking. When the migrant crisis hit Finland in 2015, for example, we were able to act fast to open reception centers for asylum seekers because there was no cumbersome organizational structure to slow down the process. All parties can learn a thing or two from this kind of partnership," Kumpula says. Head of Growth, Dr. Riitta Lumme-Tuomala is also responsible for the talent management concept and practice at Aalto EE. She is also one of the faculty members in Aalto EE's Strategic Talent Management program, in which the focus is on the connection between the company’s strategy and the right talent for strategy execution.